This study has 10 sessions, incorporating an introductory session and 9 lessons. 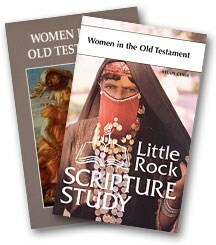 The Study Set includes the Study Guide by Catherine Upchurch and a commentary, Women in the Old Testament, by Irene Nowell (Liturgical Press). Irene Nowell, OSB, is the director of community formation for the Benedictine sisters of Mount St. Scholastica in Atchison, Kansas. She is an experienced college and adult education teacher of Scripture and a workshop and retreat presenter. She is the author of Sing a New Song: The Psalms in the Sunday Lectionary, also published by The Liturgical Press. She is also a member of the editorial board for the New American Bible, revised editionand Give us This Day (Liturgical Press). While the men of the Old Testament often garner the most attention, the women of the Old Testament become all the more worthy of our interest because we have to dig deeper to recover their special contribution to the annals of faith. Their stories are all the more remarkable in that they arise from historical eras that crimped their options in influencing or changing the flow of history. The women of this study can be bold and decisive, also meek and faithful, but they are always compelled to act in ways that bring about change. God's saving deeds often came through the mind and will of amazing women using limited resources.